If you’ve been feeling like your life is in utter chaos lately – on pretty much any and all levels – you’re not alone. This year has brought with it a crazy amount of retrogrades in terms of astrology, and we’re on the cusp of yes, you guessed it, another one. This time, we are in the foreshadowing of a Venus retrograde and with it comes chaos in pretty much every aspect of life. If you’ve been feeling “off” in your love life, bank account or even your daily routines, rest assured, it’s because of the planets. Venus Retrograde. The period of retrograde for Venus brings with it a multitude of confusion. From October 5th to November 16th, Venus will be causing havoc in all things love and money, and right now we are in what is known as the “shadow” of the retrograde, so things are already getting chaotic. What to Avoid. 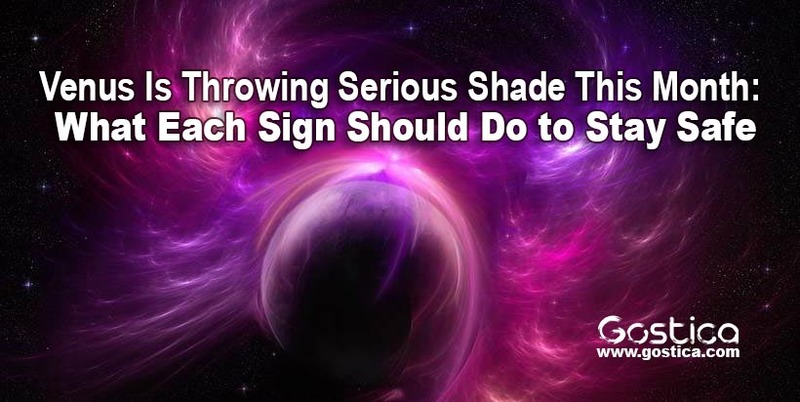 In order to save ourselves from the chaos that is the shady Venus retrograde, astrologers say there are a few things ALL signs should be practicing to keep themselves “safe” from the worst of the effects. Here are some of the biggest ways you can protect yourself during the next wave of chaos. Make It a Learning Session. “Venus retrograde in transit is a time of introspection and reassessment. Use Venus retrogrades to improve how you feel about yourself, to love yourself more. Think about what really brings you pleasure,” says Astrology King. Avoiding Temptation. The key to coming out unscathed, experts say, is to beware of all things shiny and new during this time. If you see something during your shopping excursion that you just have to have, skip it. If you have a love interest that seems too good to be true, they likely are – move on. Don’t Jump into New Relationships. Since Venus is the ruler of the heart, be prepared to likely be gaga over pretty much everything during the upcoming month. While you don’t have to avoid ALL temptations, just be wary of letting things go too deep just yet. Don’t Make Hasty Decisions. On the same level as jumping into new relationships, don’t take the opposite approach and end one too hastily either. While you’re off evaluating your situations and relationships, be cautious of making any permanent decisions you may (likely) regret later. Examining Your Relationships. “Venus retrograde is a time when we should examine our relationships – romantic or otherwise – and consider whether they reflect what we really want. And while thinking critically about your partnership is 100% necessary and healthy, actually acting on your feelings at this particular time may not be the best move,” writes Bustle.com. Wait Until It’s Over. Experts state that if the relationship still feels doomed, it’s important to wait until after the retrograde ends. When Venus comes into full circle focus, it will make things much clearer and give you a much better idea how to proceed. Don’t Move Backwards. It goes without saying then, that with Venus messing with your emotions, some of your old temptations may come back into play. You’ll want to avoid your exes like the plague, no matter how tempting they may be at the time. Remember, it’s just Venus playing tricks on you at the moment. Old Flames. “The likelihood of old flames reappearing and reigniting (or at least trying to) during this retrograde? Frightfully high, I’m afraid – but you can use this energy to actually heal old wounds,” writes Bustle.com. Experts say you should avoid them like crazy and use the opportunity to find closure. Hold It, Big Spender. Venus doesn’t only wreak havoc on your love life – it also does a number on your finances and bank account. It goes without saying then, that it’s probably not a good idea to go splurging on any major purchases during this time. Planet of Luxury. “Venus is the planet of luxury so naturally, it rules over your spending money. That said, as Venus retrogrades, you’ll want to hide your piggy bank up on the highest shelf you have, because any large purchases or financial risks are seriously not advised,” explains Bustle.com. Keep Your Looks the Same. A lesser known, but still important, aspect of the retrograde? Venus can make you want to make some drastic changes to your looks. Play it safe and avoid chopping those bangs or trying a new trendy color for now – you’ll be able to make some much better-advised changes in a few weeks when the retrograde has passed. Bite Your Tongue. Since emotions tend to run high during the retrograde, Astrology King suggests you may need to keep your temper in check. You may do much more harm than good if you allow yourself an emotionally-charged outburst at the wrong time or with the wrong person right now. Keep your lips zipped right now. Not a Good Time to Redecorate. “Just know that while you may be tempted to turn your dream-bedroom Pinterest board into a reality during this retrograde, it’s not necessarily going to be the best time to do so. Your idea of luxury during the retrograde might be slightly skewed and overly-influenced, so there are no guarantees you’ll be pleased with that disco ball you installed in your living room once the retrograde ends,” Bustle.com writes. Above all, keep it minimal in all aspects for a while until the retrograde ends if you want to avoid the inevitable regret at the end!